The above chart is a weekly UUP chart, named as a “dollar bull” vehicle, for which the primary contract holdings are found in the link. Tied primarily to the euro and the yen, the UUP rallies when these two primary currencies are weak, and declines when the two currencies see relative strength. It’s also no mystery that Emerging Markets and International have lagged this year, with the VWO (Vanguard Emerging Markets ETF) and the EEM (iShares Emerging Markets ETF) down 7.6% and 7.8% respectively. 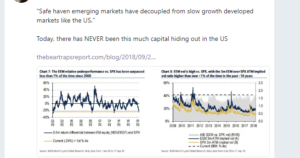 With the SP 500 up roughly 9% – 10% YTD, and the EM’s down by 7% – 8% investors are getting a good opportunity to add to EM’s and International during a period where the asset class is out-of-favor and definitely unloved. Lawrence, a frequent CNBC guest, makes the point that a lot of capital is hiding out in the US currently. Here is the key point from the first of the two charts if readers can’t see it: “The EEM relative underperformance vs SPX has only been surpassed less than 1% of the time since 2000”. That is an important statement. The point being that – if you can be a patient investor – a non-US allocation for clients will probably pay off nicely. What is the right weight for non-US allocations to client portfolios ? I suppose it depends, but Emerging Markets are 15% of global GDP and developed markets are likely more than that. Personally clients won’t own a full 15% allocation to Emerging Markets simply because of the inherent volatility therein. Both Emerging and Developed Markets are probably close to a 30% allocation of fully-diversified global portfolios, but again, all this is fluid. Unlike last year, no one wants to admit in 2018 that they have a position in EM’s and International ETF’s, funds or stocks. (Clients are long VWO, EEM, and an International Fund). Still, investors would like to see a “relatively” weaker dollar or at least a dollar that isn’t strengthening rapidly. The FOMC will raise the US fed funds rate again this week. Interest rates and real returns matter to currencies. Next weekend is the end of the quarter, and we’ll have more detail on holdings and changes within client portfolios.